Only a fool would be stupid enough to lay claim to a "traditional" Italian recipe. In Sicily they kill you for saying that sort of thing, by way of old Italian women hitting you with rolling pins. Even in Italy, the idea of what's authentic changes from one kitchen to the next. With that in mind, I make no claims that this is a traditional ragu alla bolognese. It's not served with fresh tagliatelle and it does contain tomato. If that offends your orthodox sensibilities, either cover your eyes or polish your pitchfork because you won't be happy with the anchovies or star anise. But isn't it possible that this wide world of food might just be big enough for more than one Italian meat sauce? 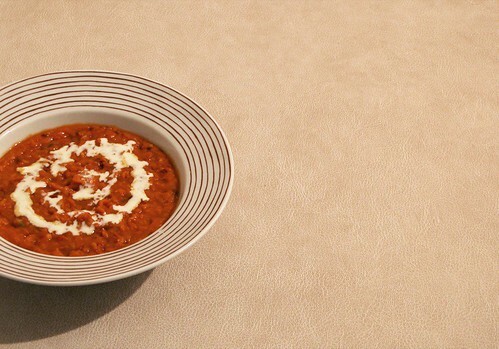 Let's make a deal: I won't call this real bolognese, if you concede that science and the expertise of Heston Blumenthal (oh, only the man behind the best restaurant in the world) might possibly, you know, maybe, make for a recipe that isn't so bad? When star anise is cooked with onions, a chemical reaction occurs producing a substance that enhances the 'meaty' flavour of a dish. It's true, Heston says so. It's effect isn't simply limited to beef either. Anchovies are rich in glutamate, which is umami central and the 'active ingredient' in MSG. Like any taste umami can be overpowering and unpleasant when used to excess, but used judiciously it boosts the flavour of savory food. In case there is anyone who doesn't know this yet: beyond the baseline expected rate of hypersensitivity to any ingested substance, glutamate or MSG is not bad for you. Pork makes everything better. If you are pork-averse, replace the pork with beef for veal mince but be sure to use a fattier cut like chuck. 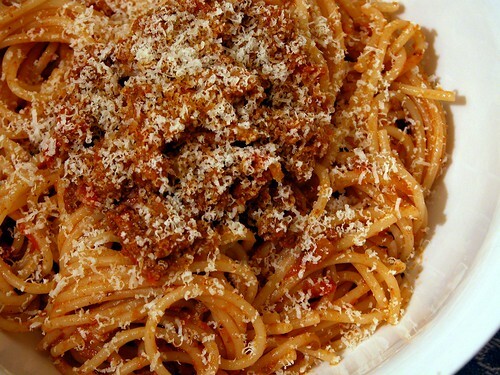 Bolognese is much more a meat sauce than a tomato sauce, so for this bolognese-inspired recipe use good quality meat. Because you're using tougher and less presentable braising cuts, even from best-quality animals it will still be pretty cheap. You can't make this when you get home from work and have it for dinner — this sauce takes at least 7 hours to cook. Thankfully most of that time is slow-cooking in the oven, so you can go and do something else. It tastes great freshly made, but even better the next day. Eat your sauce with whatever the hell you want to eat it with. The bolognese were definitely on to something pairing ragu alla bolognese with fresh tagliatelle, but spaghetti or rigatoni are a different and equally enjoyable alternative. Have it in a toasted sandwich with cheddar cheese, I don't care. This isn't about creating an authentic cultural experience, it's about making food you want to eat. A recipe for food you want to eat is after the jump. Why do you cook? Do you cook just to feed yourself? Is it because you enjoy the food, or because you enjoy cooking itself? Do you cook to impress people? Do you cook for yourself, or do you cook for others? Gentle reader, you'll have to be extra gentle around me today. If you've noticed the posts slowing down over the last week, it's because in my evenings I've been busy helping to pack a year's worth of clothes, providing a year's worth of preemptive tech support, and most importantly spending a year's worth of time hanging out with Lucy. And yesterday, she flew off to Japan. This morning as I was planning my meals for the week, nothing came to mind. Left to my own devices I'll usually throw together a miscellaneous bowl of pasta for dinner, but with Lucy around I'm motivated to make things special. Now that she's overseas (I originally said 'not around', but it's not like she's dead), it's become obvious that a large part of why I cook is to serve food that makes people happy — and there's no one I want to make happier more than Lucy. I loved cooking 'hated' ingredients in a way that she could enjoy for the first time, or when we'd be eating at a restaurant and she'd say, "Yours is better". That desire to cook good food as an expression of how I felt is what started my serious interest in cooking. It's no wonder I ate so poorly when I was single. So does this mean the end of posts at the second pancake? Not quite. Despite the sappy (but true) "cooking as love" angle, the other part of me cooks for the challenge, the competition. Some would accuse Gordon Ramsay of taking the fun out of cooking, but ignoring his media saturation and the entire US series of Hell's Kitchen, I admire him for his obsession with perfection — you can always do better. Speaking of which, let's get on with it. 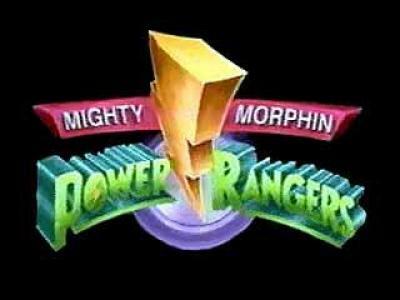 Remember when you first saw the Power Rangers? They were awesome! Five cool kids who could, at will, morph into totally wicked evil-fighting colourful superheroes! Over time, the shows got better (relatively speaking, at least). There was a bit more depth, a bit more character development, the bad guys got more complex... the Power Rangers were moving up in the world. Then you had better things to do. You missed a few shows, you went away for a while, and then it all went pear shaped. Next time you looked, there were eight power rangers, they could morph into dinosaurs and donkeys and spaceships, the plotlines became more and more convoluted. It went bad. And this, give or take a few bad special effects and poorly dubbed action scenes, is precisely what happens to wine. At first, a good red will be quite straightforward: it's made from fruit, so the main flavours you'll taste will be- wait for it- fruity. Plums and berries and shiny red cherries. There will also be some tannins- these come from the skin of the grapes, from the stems and seeds and all the woody, non-flesh parts of the grape. The word the wine people use for the tannin taste in a young wine is 'astringent'- kinda like a dry, puckery sensation. Over time, like their colleagues running Power Rangers, these tannins will improve things. The fruity flavours will remain, but will be embellished by the rich, smoky, earthy, woody flavours imparted by the tannins. This is why it's good to age some wines. They taste better and better over the years, because the tannins add more of this richness to balance out the fruit, and the final product can be amazing. When these tannins are done adding flavour they'll drop out of the wine as sediment and collect on the bottom of the bottle. This is why it's necessary to decant older wines before serving them. The problem is that you can leave your precious wine a bit too long, wait for it to grow a bit too much, and then when you finally do open it you'll fine the bottled equivalent of Power Rangers: Dino Thunder, with mechanical triceratops that fire lasers out of their horns. This is what people in the industry call 'not good'. Instead of the nuanced and complex balance of finely interlaced flavours, you just get a mouthful of wet cardboard. The wine will look brown, not red, and it'll have a tart, vinegar-esque aspect to it. There will still be some flavour kicking around, but it will be some soggy relic of what it once was. Think about biting into an apple to find a powdery mush instead of crisp juicyness. So there's no point trying to drink every bottle of wine at the very peak of its development. If you always drink a bottle too young, you're never going to be disappointed. I just wish I could say the same for Power Rangers. The other day I came across an 'instant pancake mix' at the supermarket. The instructions said to add eggs, milk, and melted butter. Come on, that's like 75% of the way to homemade! I can't in fairness criticize anyone too strongly for choosing the 'instant' option since many people don't have the time to take photos of their food let alone cook it, but who is so busy that the hassle of mixing together flour, baking powder, and sugar is worth trading for an overpriced box of self-raising flour with, inexplicably, added preservatives? The fact is, if you have time to measure milk and eggs, heat a pan, and cook the things then you have time to make them from scratch. You could conceivably make these on a weekday morning, but why bother? Leave cereal and toast to the 7 am starts and save making pancakes for the weekend, when you can enjoy the luxury of being able to jump back into bed to eat your cooked breakfast. 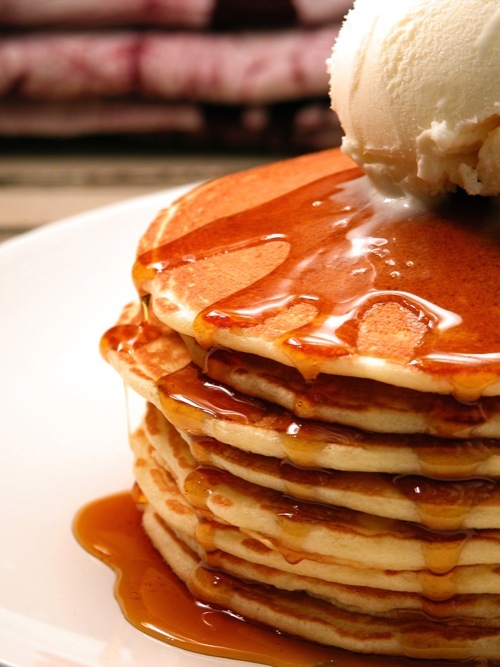 You don't need to get fancy with whisked egg whites or ricotta cheese to make great pancakes (by all means try them for a change), and I've settled on a recipe that is easy, consistent, and delicious. 1. Whisk together the eggs and the milk. Add the caster sugar. 2. Sift in the plain flour and baking powder, then stir with a whisk to combine. Stir in the melted butter and let the mixture sit for at least 15 minutes before cooking the pancakes. (2) For round pancakes, pour the batter quickly and into the center of the pan, letting it pool into a circle naturally. (3) It's important to wait until the pan is hot enough before you start cooking to avoid 'the second pancake' (hey, that's the name of this site!) syndrome. The heavier the pan, the longer it will need to be preheated (but the better it'll retain heat). Medium hot works on my stove with by pan, but yours may differ. If they're getting too dark on the bottom before the top bubbles, turn it down. If they're pale and slow to cook, turn it up. It would have been hard for me not to enjoy Skillogalee Restaurant. My visit capped off six days in Pt Augusta that despite working, felt more like a week-long fishing trip. We'd spent the day driving home through the beautiful Flinders Ranges and past brilliant green fields of young wheat, with the occasional stop alongside pine forests to search for mushrooms (no dice). Our only care in the world was the worry that we might not get to Sevenhill before Skillogalee stopped serving lunch. 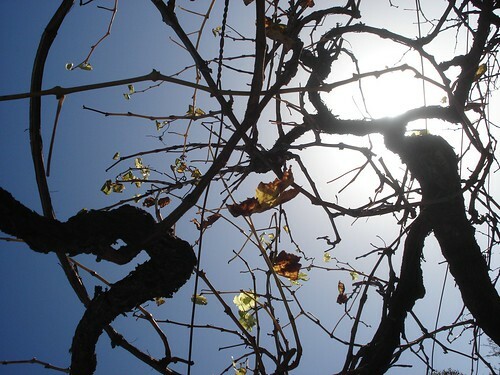 Skillogalee is a small winery in South Australia's Clare Valley. Their wine is well regarded, but for a wine ignoramus like me the restaurant is the big draw. What began as a way to offer tasters something to nibble on while they drank has become one of the area's best restaurants. It's also one of the Valley's best locations, though competition is fierce. Skillogalee nails it in the atmosphere department — hidden away at the cottage's verandah tables you can see vineyards, nature, and nothing else. The style of cooking is "modern Australian", but given the elusive definition of Australian food I prefer to think of it as "the food served by nice places in winemaking regions all over Australia". That is: European influences, local produce, charcuterie and preserves, and the very liberal use of wine. We started by sharing a serving of country terrine with pickled plums, and cabernet-soaked bread with anchovy spread. The terrine worked nicely with the plums — I only wished that the individual components would have been more identifiable in taste and presentation. For me, the anchovy spread was a standout. Out waiter told us it was made in house from anchovies, ricotta, olive oil, and seasoning, and I plan to try to recreate it at home. 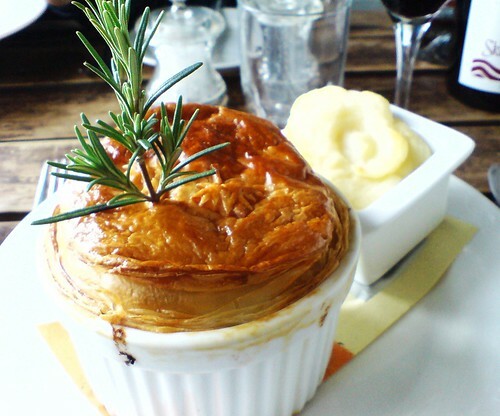 For main course I had a beef and mushroom pie, with the puffiest pastry crust I've ever encountered. Inside the filling was a rich, delicious stew that was a perfect remedy to a rainy day. Shane ordered fillet steak with potatoes, beans and a mushroom cream sauce. My small taste of it was delicious. 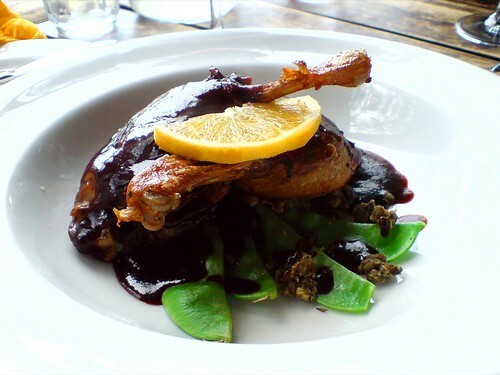 Lucy ordered a well-presented confit duck leg with Puy lentils, snow peas, and an orange glaze. I didn't taste this one, so take my assessment with a grain of salt when I say that the lentils looked overcooked. I would be remiss not to talk about the wine we drank, which was a 2004 Skillogalee Shiraz. One of the great things about eating at a winery is that while you wait for your food to come you can duck into the cellar door to taste the various wines on the list before choosing one bottle to bring back to the table. In a restaurant I never know how to pair a wine I've never tasted with a meal I've never tasted, so this was a big step forward. Skillogalee is a renowned restaurant in a great winery on a hillside in the Clare Valley. You can't get much better than that. A faulty memory (coupled with a tiredness that prevents elementary Google searches) means the name eludes me, but I'm sure a person once said "wine is bottled poetry". It's true enough, as far as I can tell. There are sauvignon blancs as bitter as the acrid gas in Wilfred Owen's Dulce Et Decorum Est, cabernets as dark and introspective as Shakespeare's Sonnet 73, and, if you're lucky enough, a muscat as seductive as Andres Marvell's To His Coy Mistress. Still, perhaps whoever said it was poetic enough to mean something more than those direct comparisons. Perhaps they were alluding to the profound insights that both wine and poetry can awaken in us. With that in mind, let me introduce the Marienberg Reserve Shiraz, 2002. It was a bargain at $22, and definitely a standout McLaren Vale shiraz. It opened with a fragrant fruitiness that sustained its distinct flavour as the heavier, woody notes arrived at the back of the mouth. It was delicious. I only bought one bottle the first time through, and returned within six months for another. There was none left. The 2002 Reserve Shiraz had been entirely sold out, and now (in all likelihood) I'll never drink it again. So perhaps that's a bit of bottled poetry about life: things will come along that enrich your world, but everything is transient and the loss of something only serves to reinforce the value it once had. Or, on the other hand, perhaps it's just a lesson in buying more than a single bottle of wine when you find one that you like. 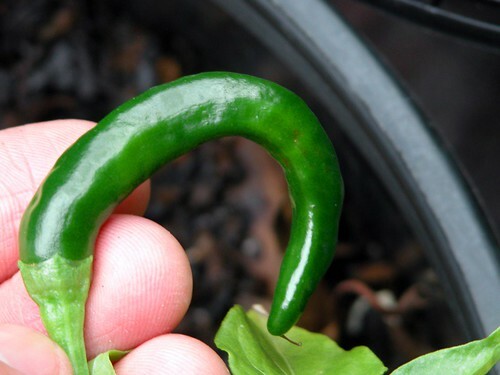 Did you know that chilies start out green before they go red? Like tomatoes? What's that, you did know? Because you're not an idiot? Oh. I didn't. In fact I so didn't know that, that I asked the lady at the garden shop for some red chilies because I felt I had enough green chilies. She laughed, kindly explained to me how chilies work, then patted me on the head and gave me something shiny to play with. It was all shiny and stuff, I enjoyed it immensely! Despite overcoming that knowledge gap, I still don't have any red chilies. I go through so many green ones cooking Indian food that it's only the rare chili hidden away amongst foliage that gets a chance to turn red. Apparently green chilies, being the unripe fruit, have a less developed flavour and sweetness but more intense heat compared with the reds (is this true? Please correct me if I'm wrong). They aren't pure heat though, and do contribute their distinct flavour to a dish. 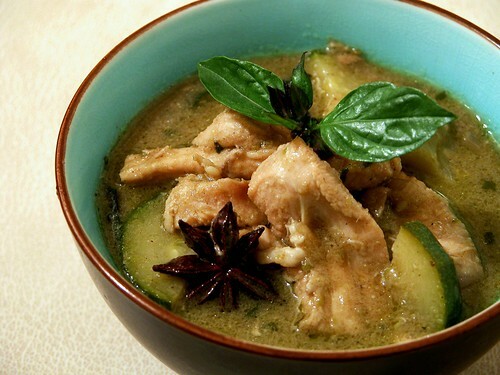 In none other is this more obvious than green chicken curry, using a freshly-made Thai green curry paste. So what are you doing? Make some! There's something deeply satisfying about making a lasagna. Totally unprepared it can be an afternoon's work, but it's relaxing, stress-free work. 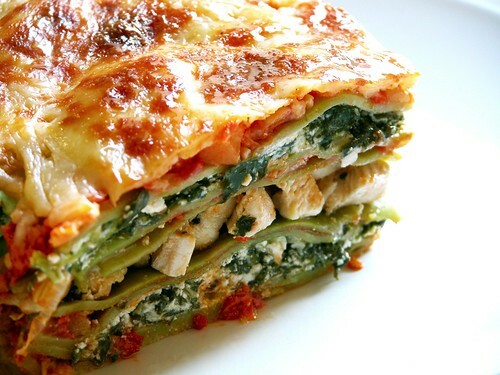 There's no bread dough to not rise and no large cut of meat to be perfectly cooked long before the vegetables are finished, rather you can work happily in your kitchen on each part of the lasagna and bring it all together when you're ready. Best of all, fifty minutes later your industrious self is rewarded with the similarly satisfying experience of eating lasagna, to enjoy while wondering why you don't bother making it more often. You simply can't beat the traditional bolognese & béchamel lasagna, but my chicken & spinach lasagna is formidable competition. The recipe itself is made up of a number of smaller steps. The pasta, the sauce, the ricotta, and the chicken can all be prepared ahead so take your time. Now if you would kindly take your seats, the recipe will begin shortly. On midnight waterfalls and winter sun. It's Winter in Adelaide, and the sun is shining. It glows in the pale sky, sending arcs of warmth through the chilled air. The coldness creeps from the earth to reclaim the day. Dew, wet with morning, sogs my feet with its frosty tounges. Still - the sun is shining. The breeze is pushed and tousled by the trees as they shiver off the night's cold. The sun is shining in a blue sky, in Adelaide, in Winter. This is the kind of day that can transcend the strictures and structures with which we prop up our artificially busy lives. I have no thought for the papers that need reading, the room that needs cleaning, the report that needs writing, or the forms that need filing. This is not a day for such trivial needs. What I want, what I really need, are the simple things that are too often obscured beneath the tired-eyed exhuastion of a modern life. Sun in my eyes, a cool breeze in my hair. Food to eat, to nourish, to fill. Friends to share it with. Wine to celebrate it with. It is now evening. We have stealthily sneaked into the conservation park that is a few minutes walk from my friend's house. We have walked the trails, lit by moonlight, up to the second waterfall. We climb over the handrail and sit on the edge with our feet flowing over, anchored to our bodies, swaying in the night air. The hills hide the street lights, and the stars peek shyly from behind the crowd of clouds that have settled over the sleeping city. We share bread, and cheese, and wine. This evening, our liquid lover is the liqueur verdelho from Sevenhill, in the Clare Valley. It is the oldest winery in the country, and is still run by a handful of Jesuits who see their creations as the perfect expression of a love for God and for our extraordinary world. The vines are blessed before harvest. The priest who maintains the cellar door makes an incredible bolognese and always serves it with a bottle pulled casually from the cellar. The tasting list is ridiculously long, but the Scottish cellar hand who was there when I last visited saw that as no reason why we shouldn't try the lot. He'd pour a new glass before the old one had hit the counter, and would regale us with tales of gentle Armenian warlords and insane London landlords. Afterwards, we lunched on the grass and had a slow, full-stomached game of football before continuing on our way. To continue, then: it is now evening. We are on a waterfall (dry, of course- this is Australia), bathed in stars, minutes away from the gridded city streets. We open the Sevenhill liqueur verdelho and splash it into the glasses that rest tenuously on the worn, undulating stone. It is a smooth, suave wine. It will court your lips, flirt with your tounge and seduce your throat. It starts with a warm, syrupy sense of honey and nuttiness, which then grows into a toasted caramel that understands the meaning of 'too sweet' and remains respectfully on the right side of the fence. Many of its liqueur contemporaries are dogged by a slick, oily shadow of taste that wipes its dirty feet on your tounge as it passes by. Sevenhill rise above this unpleasantness and the verdelho continues onwards, now with a full, chewable flavour of toffee that swells, pirouettes, bows and recedes with no trace of tartness or hastiness. This wine, my friends, is an utter gentleman. And we drink. The world spins us slowly away from the moon and midnight passes unnoticed among these friends, this wine, this waterfall, and this lovely day. Time surges on, and now it's only two short weeks before Lucy's off to Japan. I cooked dinner for her relatives who were visiting Adelaide, and at her request: beef & potato vindaloo. I know, I know, vindaloo is made with pork. Even if it were made from meat other than pork, Indian Hindus would disapprove of beef. And despite the presence of "aloo" in the name, the dish traditionally doesn't contain potatoes either. But when traditional Indian cooking is leaving the country for a year, then I'll make it the way traditional Indian cooking likes it. My Mum's side of the family are Portuguese-Indian from Goa, which would be an excellent launchpad to talking about how much this classic Goan dish means to me and my cultural identity. That stuff would kill. Unfortunately I've never actually had a proper vindaloo outside of a restaurant, so like most regular schmoes I used a recipe. Be careful when selecting a recipe — it shouldn't contain tomatoes, yoghurt, or god forbid, cream (really it shouldn't contain beef or potatoes, but that aside...). 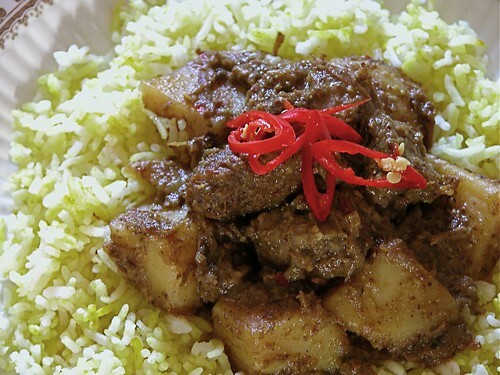 The recipe that I used (below) suited making it with beef and potato, but the best and most authentic vindaloo I've ever made was from this recipe on eGullet (pictorial here). Try both, you won't be disappointed.